Much of what has been said about Trump’s support from working-class voters is either false or unproven. Even worse, flawed analyses reinforce damaging conservative narratives and undermine worker solidarity. In this week’s Working-Class Perspectives post, Allison L. Hurst calls for a more inclusive understanding of the working class in America. 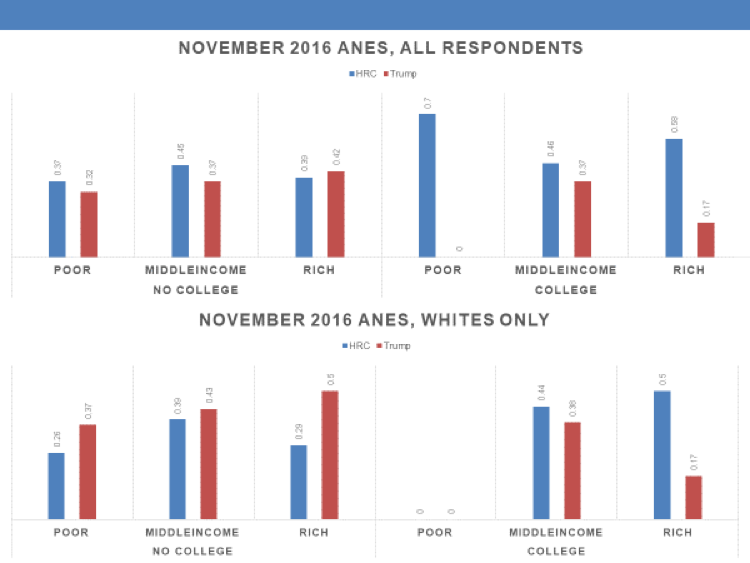 This data doesn’t show the white working class overwhelmingly in support of Trump. Not more than half of the working class even voted, so to say that the “white working class” gave us Trump seems more than a little overstated. Clinton’s election narrative echoed these ideas. She wanted liberals to see this election as a referendum on race and inclusion, and anyone who was against her was deplorable or being used by deplorables. As Sharon Sullivan has argued, “one of the main ways that white class hierarchies operate is through the production and display of white middle-class moral goodness.” Have you noticed how infrequently rich whites are called out for being deplorably racist? Honestly? This election wasn’t a referendum on anything. We had no good candidates to choose from. We didn’t choose either one of them. Millions of Americans sat out the vote (or were pushed out, but that is another story). And each of the millions of people who did had their own reasons for casting their vote. Most likely we’ll never be able to get to the bottom of how much racism, sexism, and other prejudices motivated voters in this election. (On a side note, is it really that surprising that a critical mass of white people respond to racist dog whistles?) Yes, we need to try to understand the attraction of a strange man who seems to appeal to our worst instincts and desires, but not at the risk of failing to come together to continue the fight for a better world for all of us. Politicians manipulate. Let’s stop focusing on who is manipulated and why and focus instead on making sure this doesn’t happen again. I would suggest that the main reason we are currently focused on the working-class vote, and not, say the professional-managerial vote, or the rich white male vote, is because these people are respected to make decisions. In contrast, pundits and analysts have always questioned ability of working-class people to make decisions. This is just another way the educated left is playing into a conservative narrative of condescending liberal elitism. Here’s the problem as I see it. If Trump’s supporters came from all sections of the (white) American electorate, the narrative of working-class support of Trump diverts us from the real story, which is much more ordinary. One party — a party that denies climate change, that wants to rollback protections for workers and the planet, that is willing to sacrifice millions of lives to the Moloch of economic growth — has managed to suppress its opponents’ votes (the majority of poor and working-class people do not vote), spin a story of a liberal media being out of touch with “regular Americans,” and lead kind-hearted but possibly naïve liberals everywhere to once again fear the (white) working class. Neat trick. any Leftist coalition will be destroyed by fear and mistrust.